What if you could realistically achieve the kind of wealth it takes most people 10 years or more to accumulate and have this wealth in your hands in as little as 9 months? Sound crazy? Good! Chances are you are one of the millions of people that have been led to believe that you have to wait a long, long time, sometimes up to 30 or more years, for your wealth goals to be achieved. The good news i… s you do not have to wait that long and can have your financial chips in a matter of months not years! Inside these pages you will find a proven system, complete with easy instruction, to achieving your financial goals now vs. having to wait for your financial payday and hoping your money will be there after working all of those years. 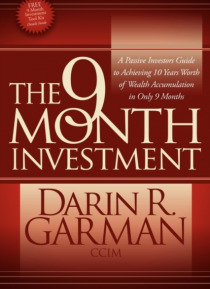 The good news about "e;9 Month Investing"e; is it not only eliminates your biggest enemy, TIME, the methods are also easy to follow and implement as well. No excuses! Now anyone, if they know how, can achieve the wealth they want and deserve in a matter of just 9 months!